It has been a busy couple of weeks since my last post and I have a lot to tell you about this time, including a few tips for working through Block Four, a summary of the lovely Lily Pond workshop I tutored at Stylecraft last week, as well as a few other things that have been going on, but I want to start by talking briefly about the bag pattern that I designed using the left over yarns from the Lily Pond CAL as I am aware that there is a lot of chat on social media about the pattern and I know that Sylecraft have been inundated with requests for it. 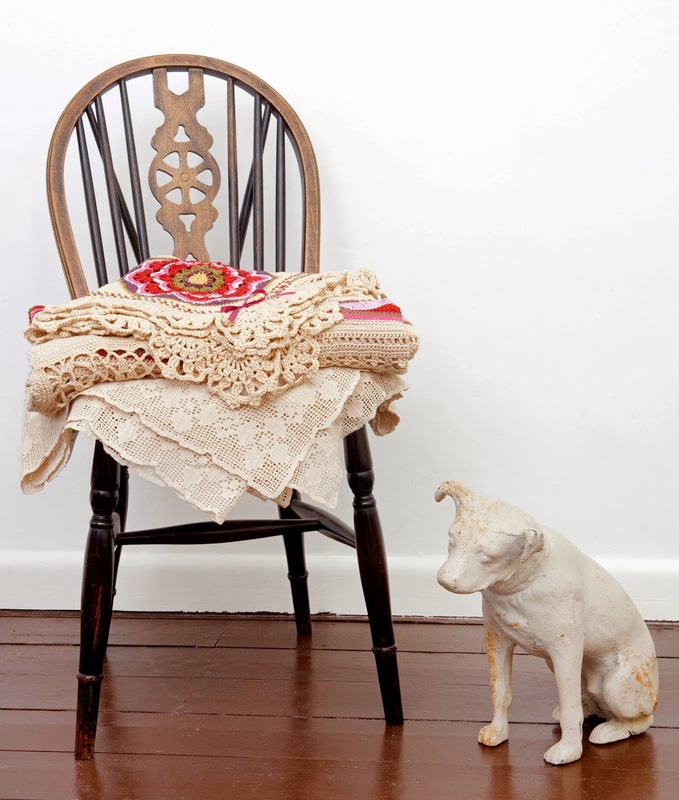 I am an independent designer and I am not salaried or tied to any yarn company. 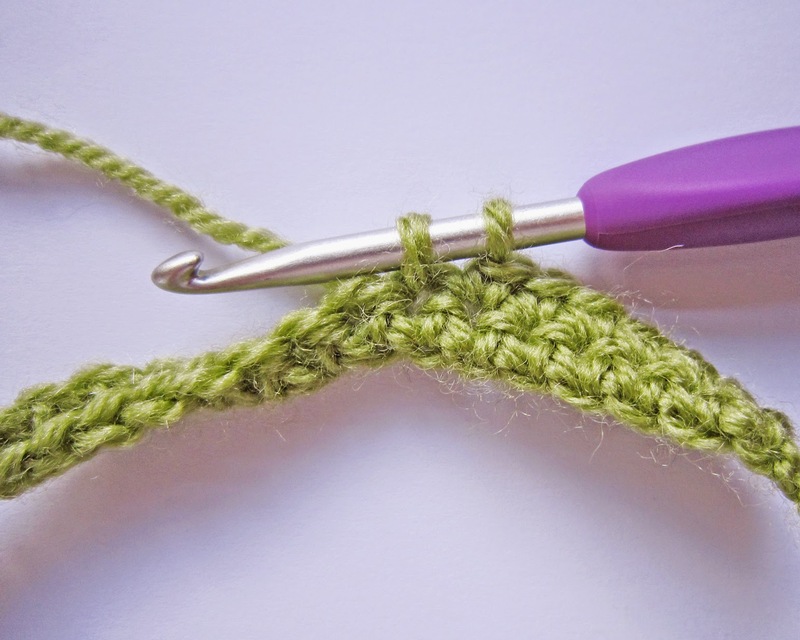 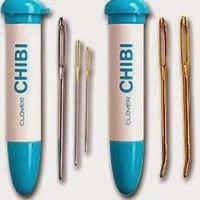 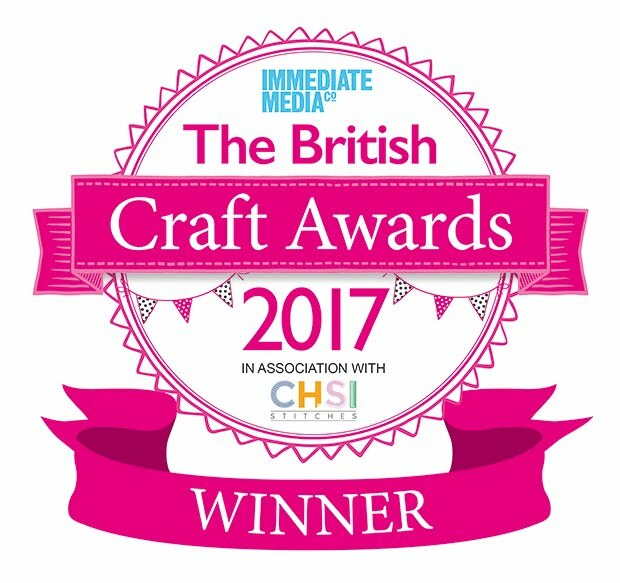 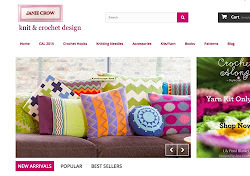 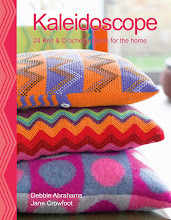 I work within a highly competitive field and, in order to boost my income from my design work, my husband and I run our own web site selling knit & crochet accessories, books and kits. 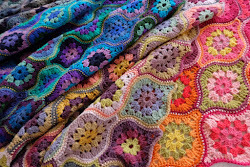 The bag pattern was designed by me as an incentive for crocheters to purchase their Lily Pond CAL yarn kit via our web site (Janie Crow) rather than from another retailer as we currently cannot compete with the 'big players' within the online yarn retailers, many of whom offer discounts, free postage and multi buy offers continuously. 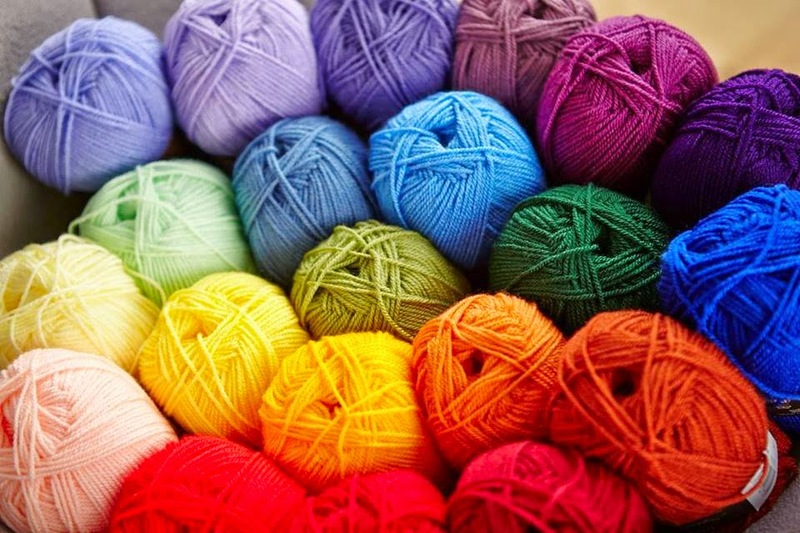 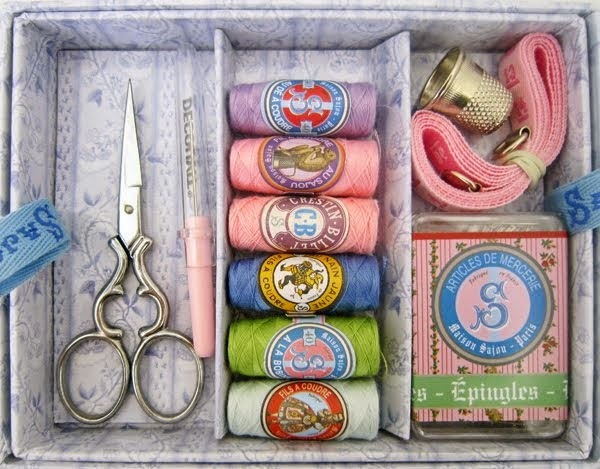 We sell the CAL yarn kit via our web site and the bag pattern is our point of difference in relation to this - in the same way that the larger companies give free organza draw string bags or free US postage for example. 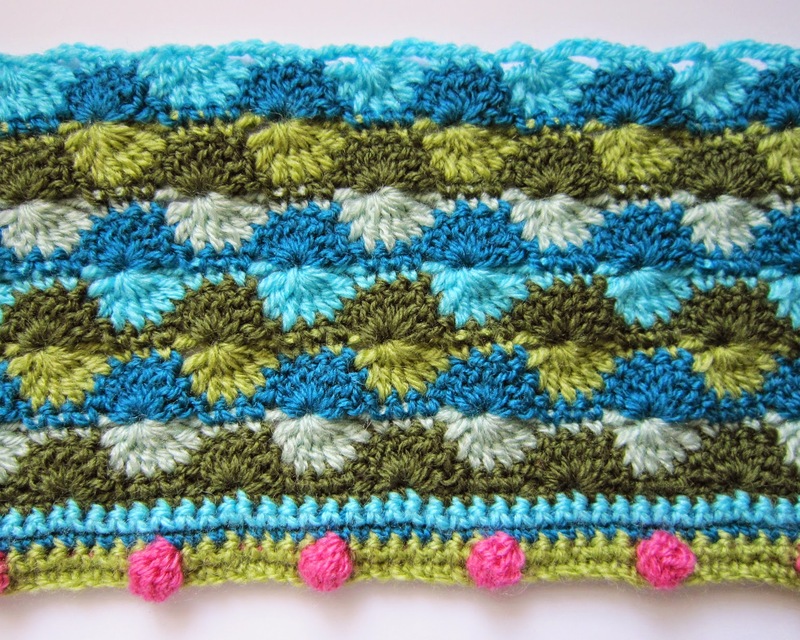 When I designed the pattern I had no idea just how many people would like it, or how many thousands of people would end up working through the Lily Pond CAL project. 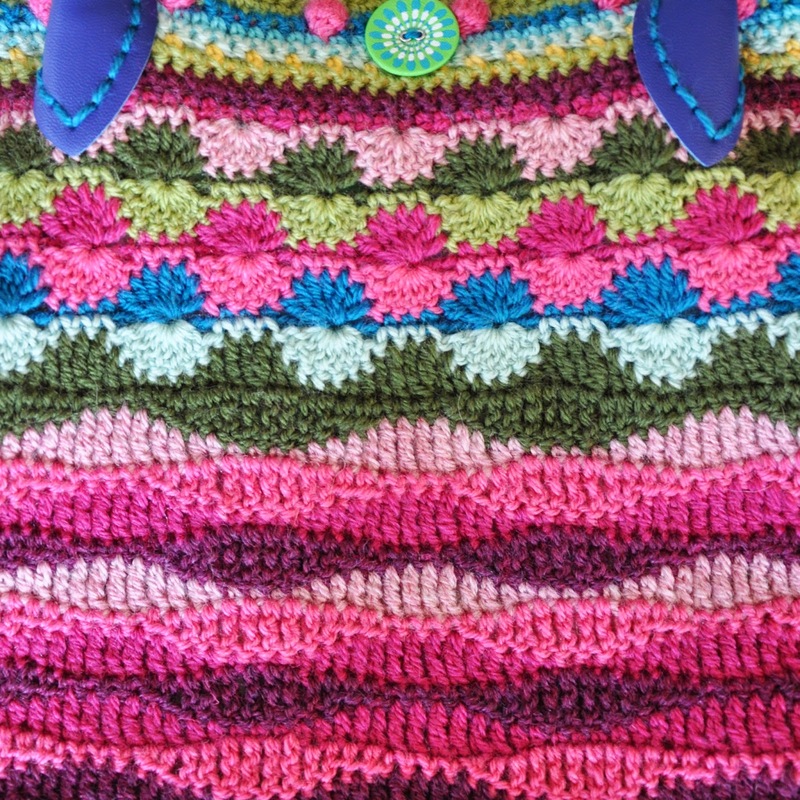 Possibly, had I realised what the demand would be, I wouldn't have offered the bag pattern as an exclusive to my customers, but, having said that the design is an exclusive to Janie Crow customers, I feel it would be unfair to go back on my word and start giving the pattern to others. 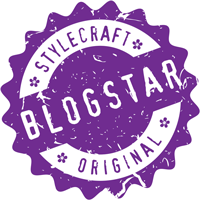 The bag design was not commissioned by Stylecraft and they are not to blame for the fact that I have chosen to offer the bag as an additional extra to my customers and not to everyone working through the CAL project. 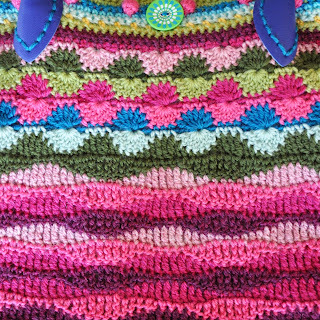 I have seen comments in relation to the bag project on social media which include words like 'unfair', 'let down' and 'disappointed'. These comments are, in my view, unfounded - the bag pattern was not used in any Stylecraft branded pre sale information and was never a part of their CAL offer. 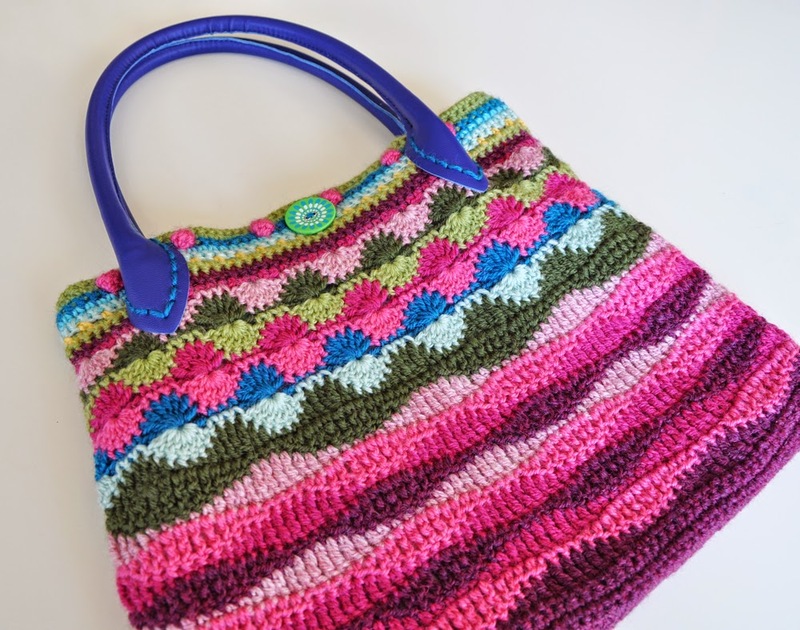 At the present time I do not plan to release the bag pattern for sale, but I might well use it within other promotional offers in the future, so it is worth looking out for it later on in the year. You can also work through the bag design within one of the designated workshops such as the one I tutored at Stylecraft last Friday (more info further down this post) and I will be tutoring another one at Black Sheep Wools in Warrington in July - there are currently just 3 places left on this workshop so you might need to be quick if you want to grab a place. I hope this little explanation will help you understand why the bag pattern is not currently available and might encourage some of you to take a look at the Lily Pond design and come up with your own bag designs as an alternative. 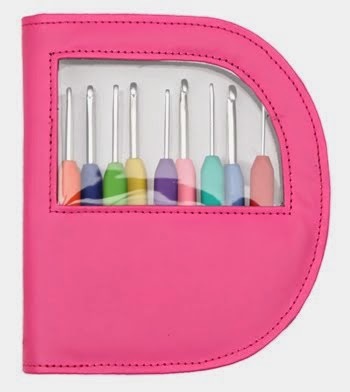 Designing stuff is fun and I don't have a problem with you coming up with your own variations so long as you don't publish an exact copy of my bag or try to make your own profit from doing so! 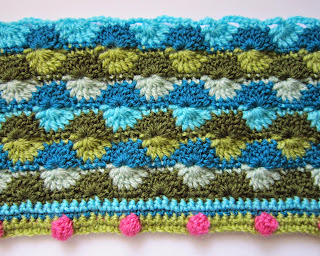 I really like this block! 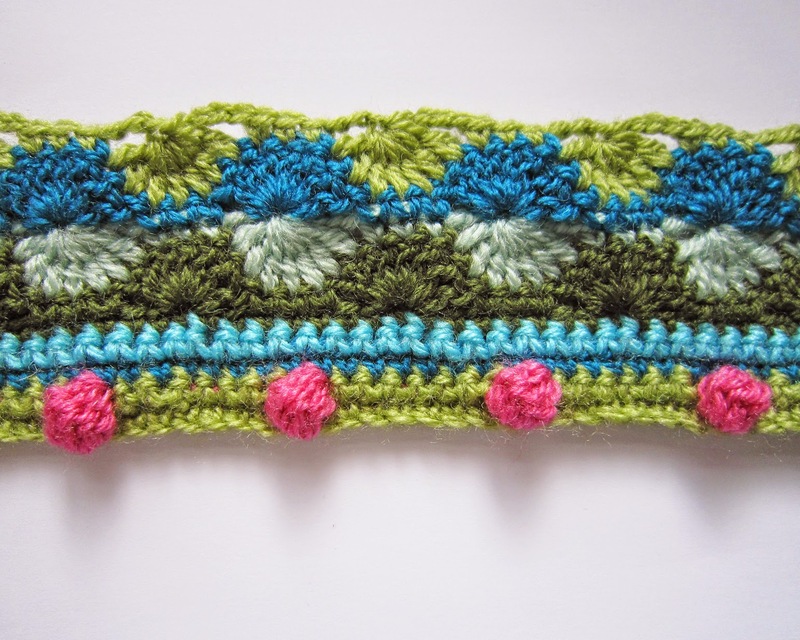 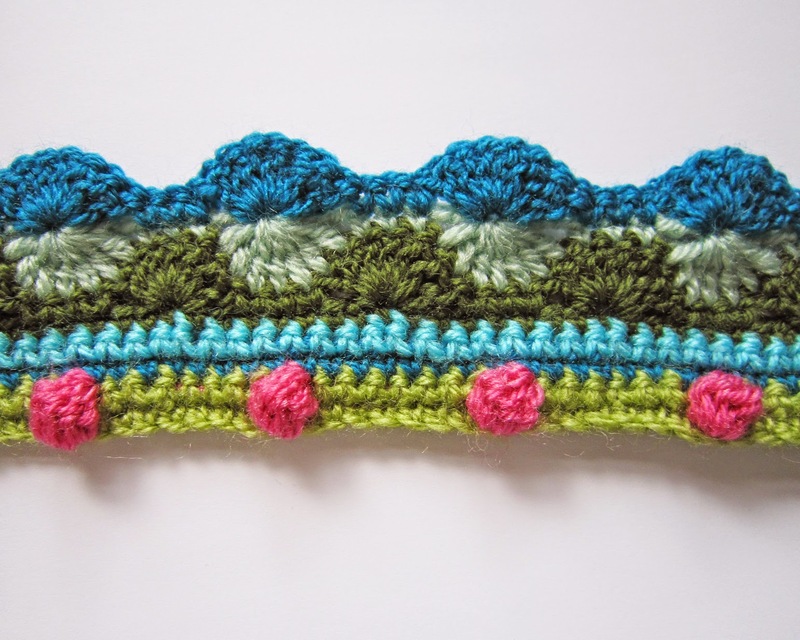 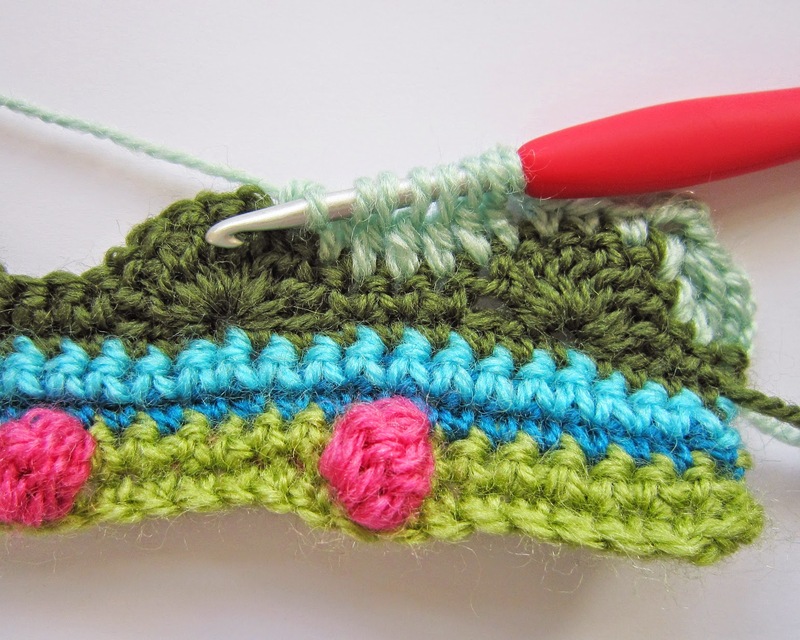 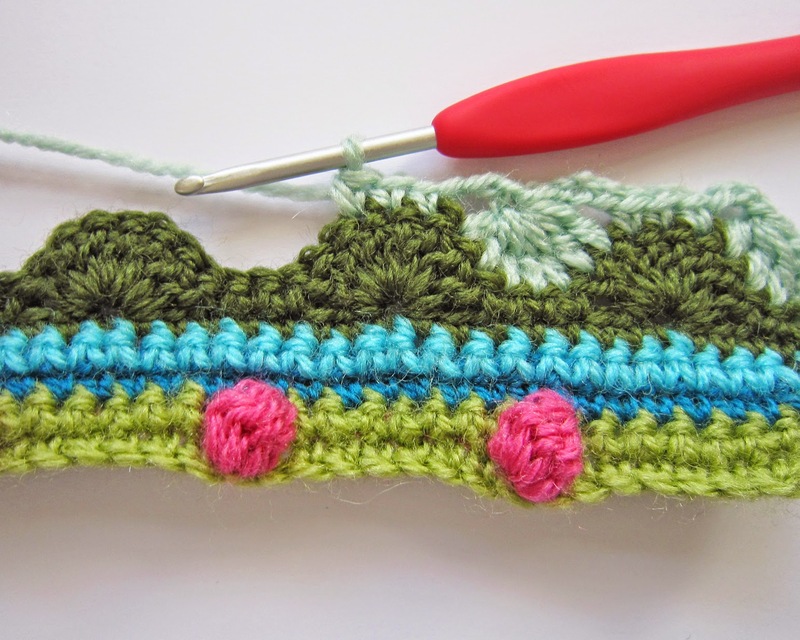 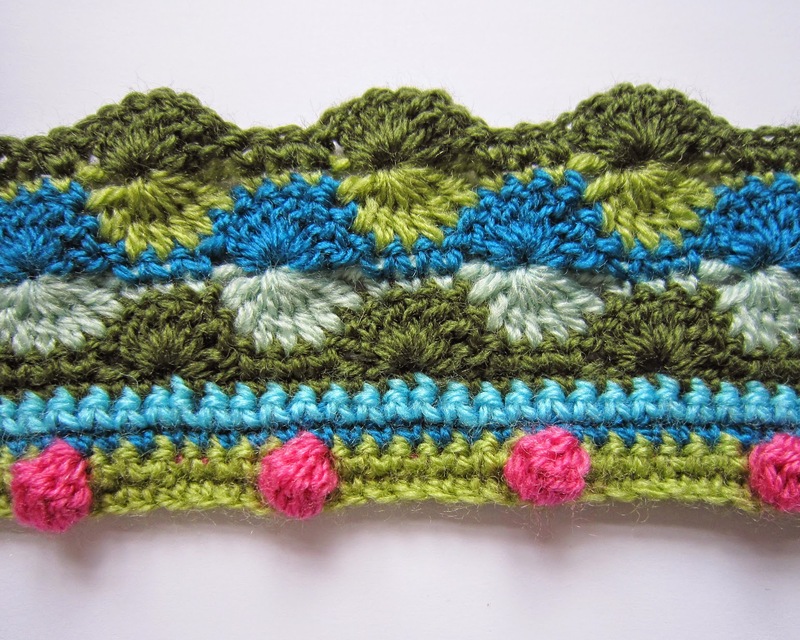 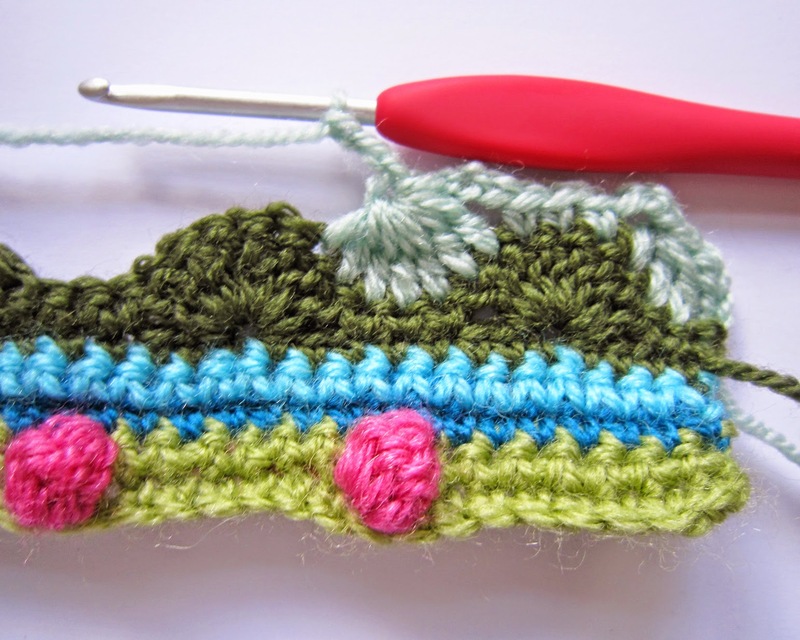 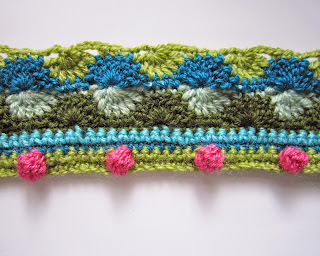 I love doing multi coloured bobbles and use the pin wheel stitch a lot in my design work, it really is so satisfying seeing those lovely crochet fans and clusters creating the stitch formation. 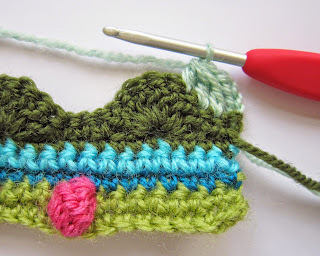 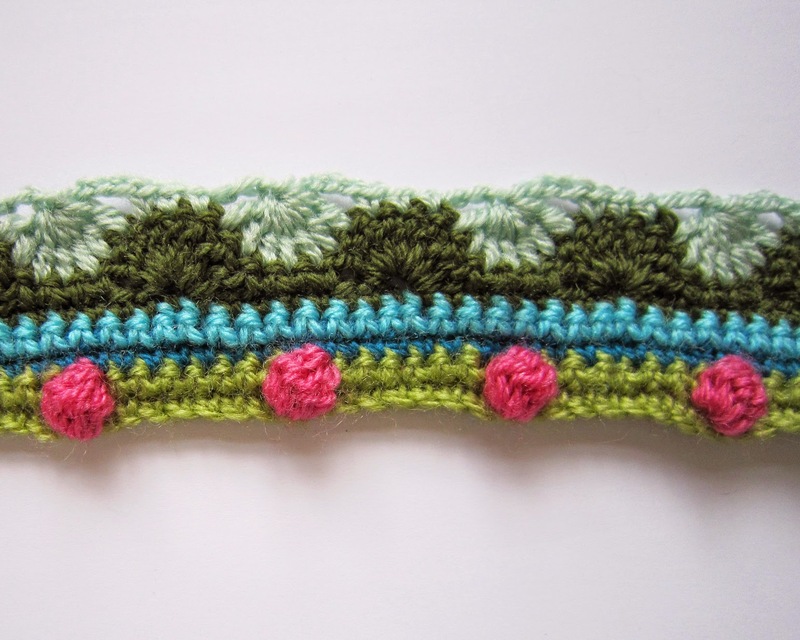 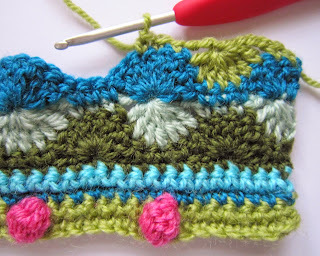 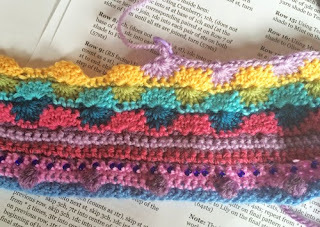 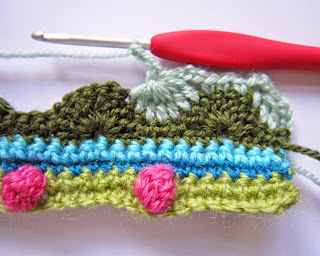 If you haven't done multicoloured bobbles before they can be a bit fiddly. 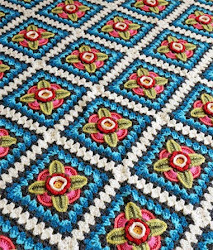 I have pasted some of the images from the pattern below to help you - sometimes it is better to see these on a larger scale, so you could always copy and paste them to your own document or save them as images on your PC or note book. 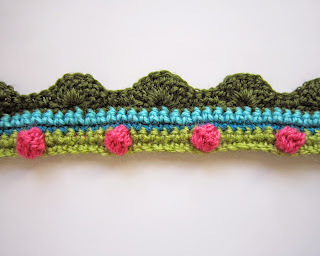 Bobbles are made on a wrong side row because they pop through to the opposite side. 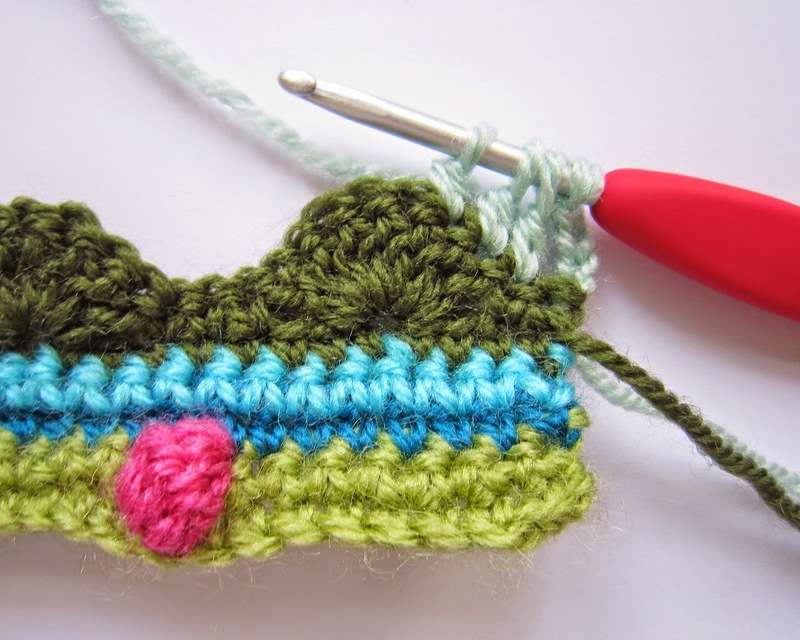 You need to change yarn shade one step before the end of the stitch before the bobble so that the loop on the hook is the new shade. 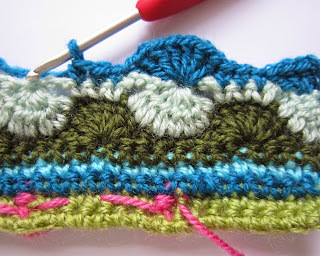 You will be on a wrong side row again when make the first row of fans - the image is taken from the right side of the work. 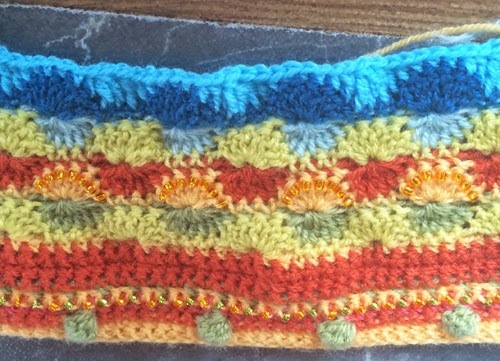 the fans are made by working 7tr (US dc) into the same stitch. 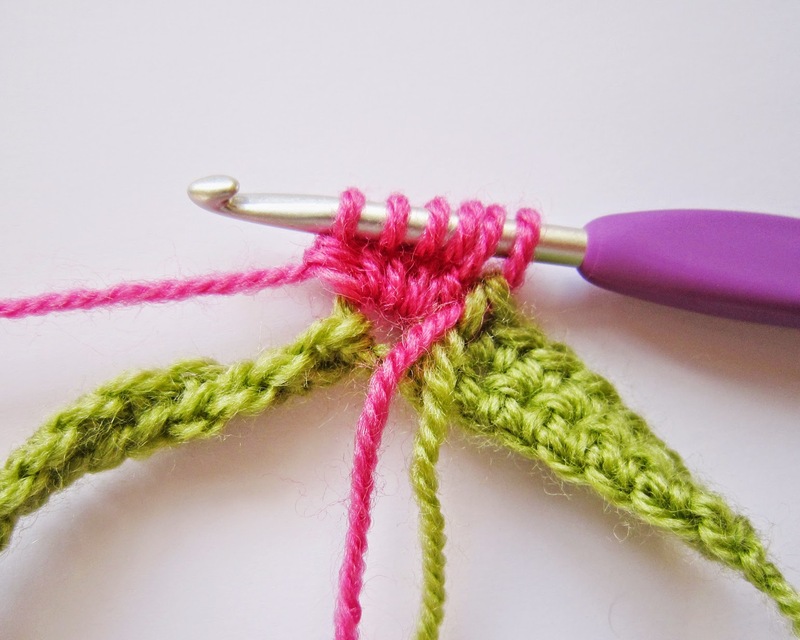 Make sure you skip 2sts before and after the fan - double check as it can be easy to skip too many or too few. 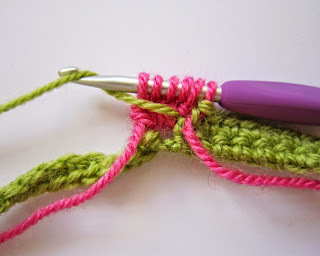 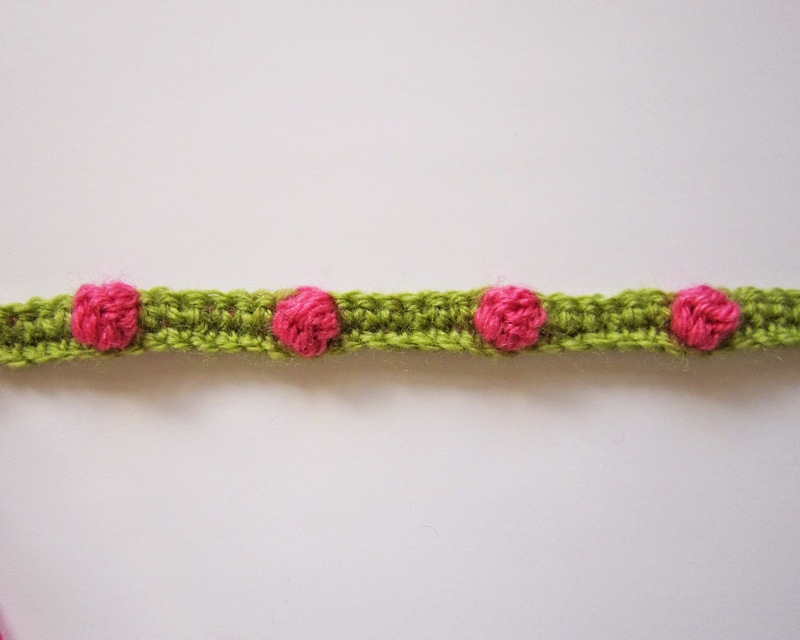 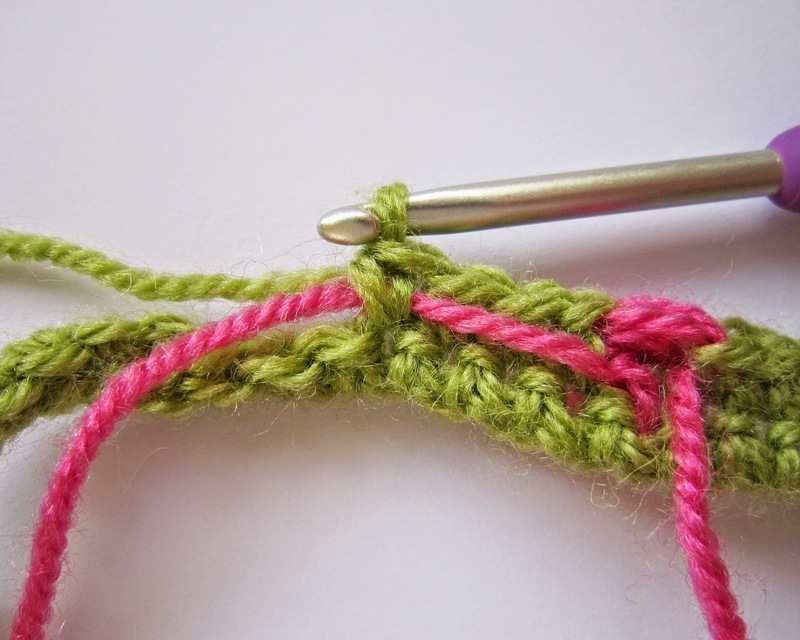 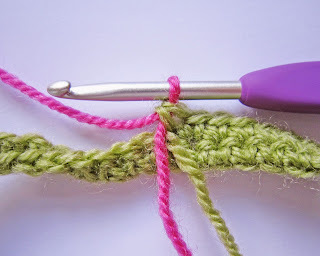 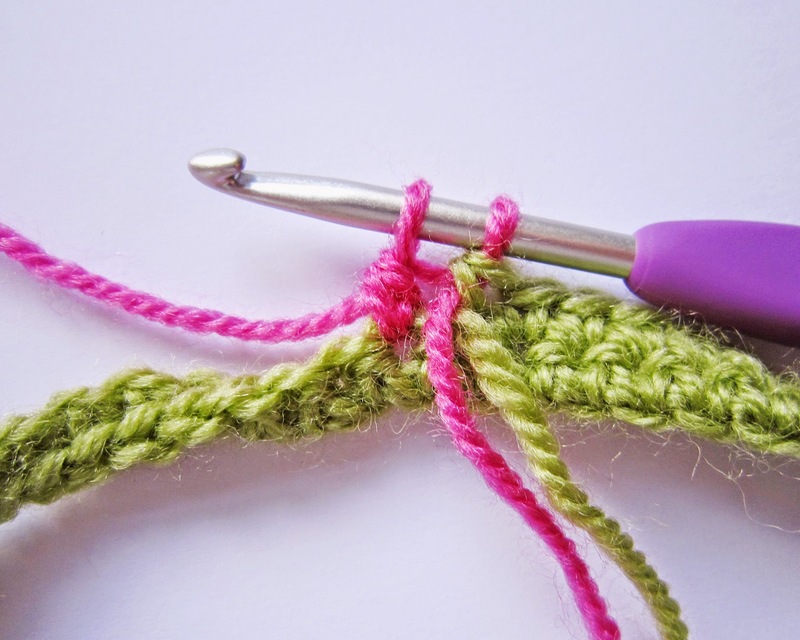 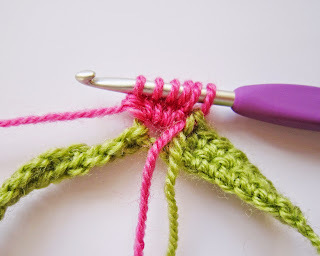 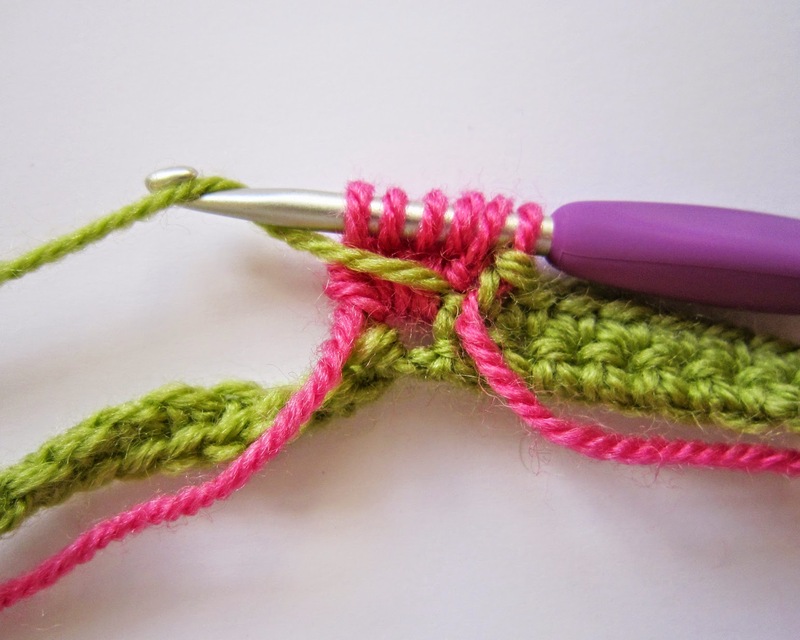 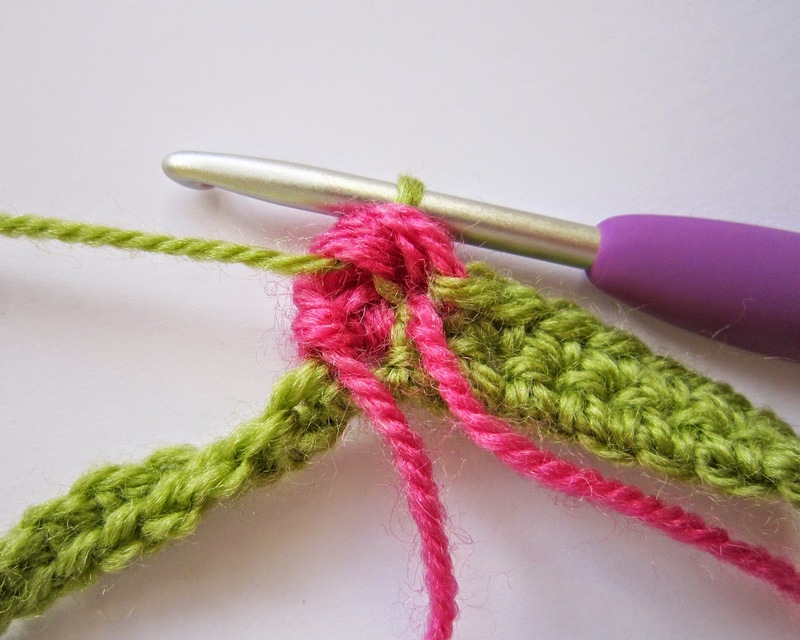 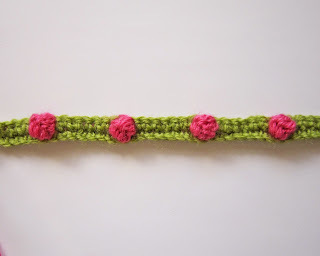 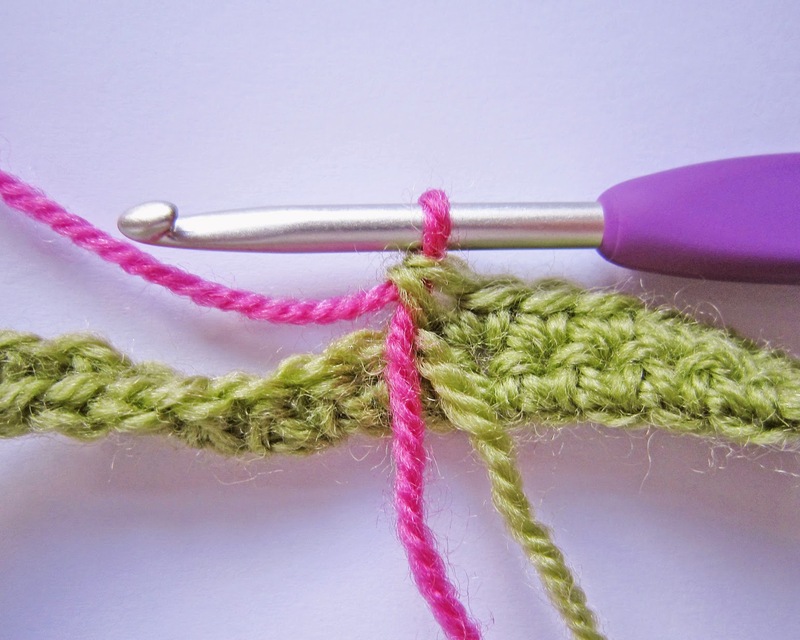 At the beginning of the next row you need to make a cluster over 3sts - you do this in the same way as you made the bobble, but you work into 3 separate sts. 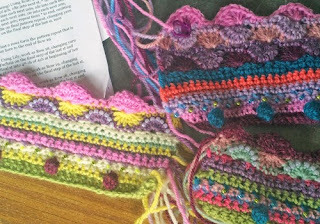 The next cluster is worked over 7sts. 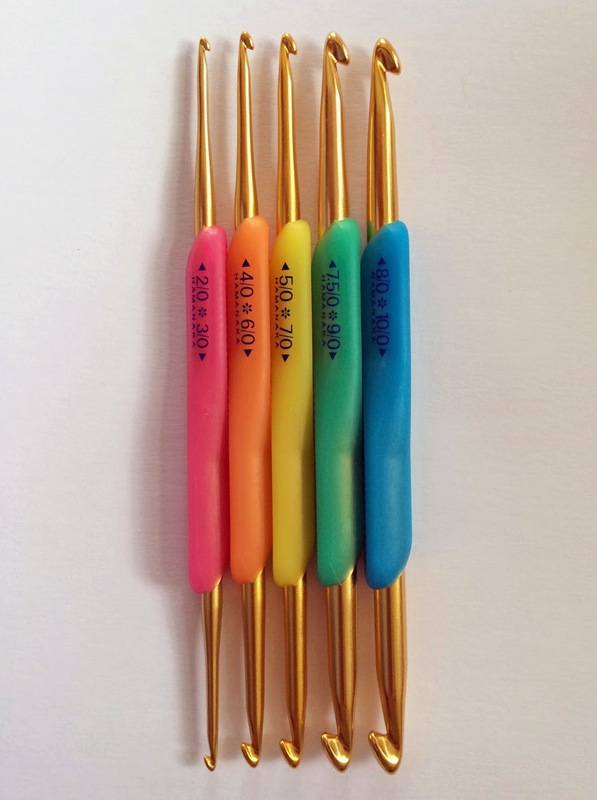 To make sure the cluster is central, the 7sts are made by working 2sts on top of the last 2sts of the fan made on the previous row, 3sts along the 3dc (US sc) made on the previous row and the final 2sts from the first 2 sts on the next fan. When you make the next row of fans, you need to work your 7sts into the stitch at the top of the cluster made on the previous row. 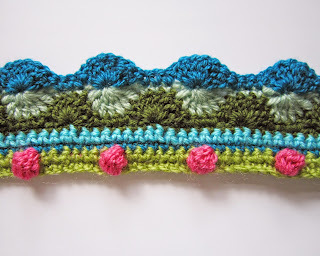 When I designed this block I felt like the pin wheels looked like small lily leaves emerging from the water, but you can get a very different effect if you use similar shades to make the 2 row repeats and it can be even more fun if you add beads. We had fun playing with colour and stitch combinations at the Stylecraft workshop last week and you can read more about this below. 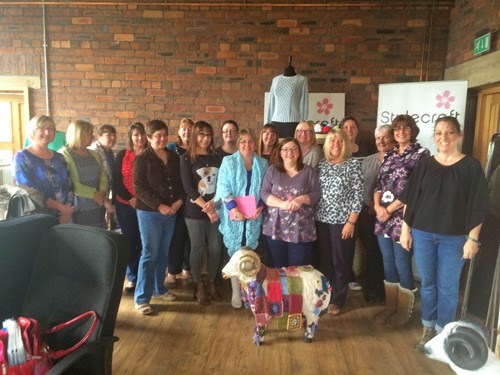 I had a lovely few days travelling around 'up north' last week as I was asked to host afternoon tea at Black Sheep Wools and a workshop at the home of Stylecraft at Spa Mill. I had a really lovely afternoon at the craft barn at Black Sheep and you can find more info about my afternoon by following this link to the Black Sheep blog. 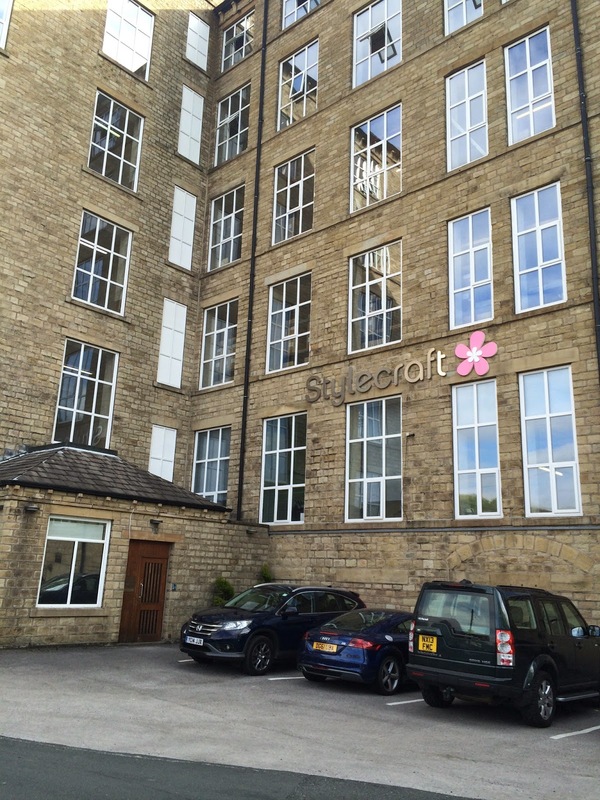 After the event at Black Sheep I drove (very slowly whilst admiring the amazing scenery and abundance if sheep) to the home of Stylecraft yarns in Slaithwaite ready for my Lily Pond Bag workshop on Friday. 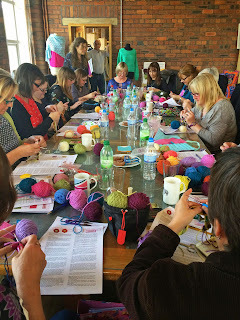 It was so nice to meet all the ladies who came along to the workshop, some of them had come a long way to be there, including one lady from Cornwall and another one all the way from Holland! 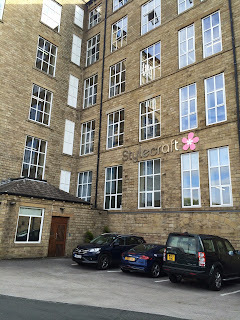 Being at the mill also gave me the chance to meet the lovely team from Stylecraft and I was made to feel so welcome I didn't want to get back in my car and drive home! Once again I am at the end of another blog post. 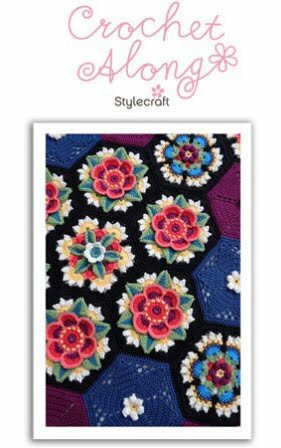 If you haven't downloaded the pattern for Block Four already you can find the link to the Stylecraft web site here. 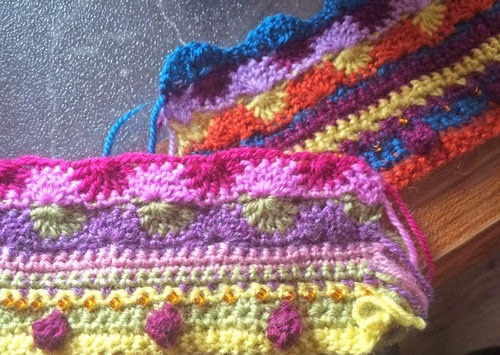 It is amazing to think that once you complete these blocks you will be almost half way through the project - doesn't time fly when you're having fun!